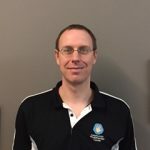 With nearly 10 years at the Kalamunda Physiotherapy Centre, Jon Splatt is a valued member of the team with a calming approach his patients appreciate. Jon has extensive experience in musculoskeletal injury and rehabilitation, and uses dry needling acupuncture as a treatment for pain relief and muscle tightness, where appropriate. He also has a keen interest in cervical dysfunction and patello-femoral dysfunction. His knowledge and participation in sport help him develop tailored fitness programs for use in the gym, pool or home, so you can build the strength and flexibility to minimise further injuries, improve recovery and aid pre and post operation outcomes. He also supervises gym classes in our Kalamunda Physio gym. A former State League representative for the Kalamunda Eastern Suns Basketball team, Jon is able to apply this knowledge to the assessment, treatment and rehabilitation of many sporting injuries. Jon and his wife Sara have two young children who keep them busy and entertained on a daily basis.